The Phoenix 200 HT LGR Dehumidifier is a high capacity unit for use by water damage restoration specialists and is notable for its ability to operate effectively at extremely high temperatures. This has several operational advantages and can contribute to the effectiveness of restoration projects while making them more profitable for operators. Despite its power and performance this is a portable unit with modest dimensions and manageable weight to facilitate transfer to and between work sites. The Phoenix 200 HT LGR Dehumidifier is a powerful unit with a water extraction rate of 140 pints per day. This rate was tested at the AHAM standard of 80°F and 60% relative humidity but in more extreme conditions this may rise to anything up to 260 pints (@ saturation). 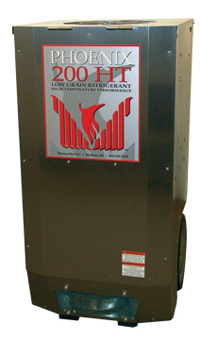 The 200 HT uses Low Grain Refrigerant technology to remove more moisture more quickly from the air without using more power and is more effective because of its ability to reduce specific humidity to values below 40 grains per pound and energy efficient, drawing only 7.5amps. Where other dehumidifiers cannot compete is in high temperature operating conditions. The Phoenix 200 HT LGR Dehumidifier can operate up to the extraordinary level of 120°F. How does it do this? Phoenix have achieved this by developing an effective technique for bypassing ambient air over the condenser when ambient temperatures are above 80°F. Above 80°F - When used in high temperature conditions (above 80°F), the refrigerant pressure inside the condenser rises. By removing the grain control magnet from the by-pass openings, additional airflow is directed over the condenser and less airflow is directed across the evaporator. This airflow lowers the refrigerant pressure in the condenser while also slowing down the air across the evaporator, which allows the air to reach its dew point. Between 50°F and 80°F - When used in normal dehumidifier operating temperatures (50°F to 80°F), the grain control magnet should cover the bypass openings. This allows increased airflow across the evaporator and increases performance by increasing the amount of air that is dehumidified. Below 50°F - When the Phoenix 200 HT is used in very cool operating temperatures (below 50°F), frost will form on the evaporator coil as it dehumidifies. When enough frost forms, the defrost thermostat will initiate the timed defrost cycle. The cycle periodically turns off the compressor while allowing the blower to run. The grain control magnet should cover the bypass openings in this operating range because the increased airflow and static pressure will help defrost the evaporator more quickly and efficiently. The advantages of this feature, compared with other LGR dehumidifiers are that drying when the ambient temperature is very high accelerates the rate of evaporation of moisture from a structure compared with the rate in cooler conditions. This reduces or eliminates the need to remove drying equipment to control the temperature within the drying area. The benefits for the customer are obvious, the faster the drying process the happier he or she will be. Happy customers generate more recommendations for a business. Faster drying, with fewer interruptions, also means lower costs, more intensive use of assets and the ability to work on more water damage restoration jobs in a given period, which is good for the bottom line. Other features of the 200 HT include a high air processing rate of 335 CFM. This contributes to the units effectiveness and also assists in ducted operations, providing higher static pressure. Like other Phoenix dehumidifiers this unit offers multiple ducting options with a 12” intake and a 10” layflat supply. The 200 HT also provides superior air filtration with a pleated media MERV-11 air filter which is both washable and replaceable. This protects the unit and improves air quality in the operating environment. For disposal of the condensate the 200 HT incorporates a condensate pump with a vertical lift capacity of up to 20 feet. The unit is constructed with a stainless steel housing for durability and a pair of wheels and a handle for ease of mobility on site. On the rear of the unit is a skid-plate to enable easier loading to and from vehicles. The unit is compact for its power at 20.25 x 21.375 x 40 inches and its weight is a manageable 138 pounds. The Phoenix 200 HT LGR Dehumidifier comes with a five year warranty which covers the sealed refrigeration parts for five years and parts and labor for one year.